why is nobody, NOBODY looking up? Bahaha everyone else is wearing that too!!! I think you guys are idiots if you don't know that this is a Touhou Fest. ATTACK OF THE BOBLE HEAD AHHHHHHHH !!!!!!!!'!!!!!!!!!!!!!!!!!!!!!!!!!!!!!!!!!!!!!!!!!!! Watch out for flying chibi heads! just put the head in! HOLY MOTHER OF GAWD, RUN FOR YOUR LIVES! ITS GODZILLA'S BALLS! 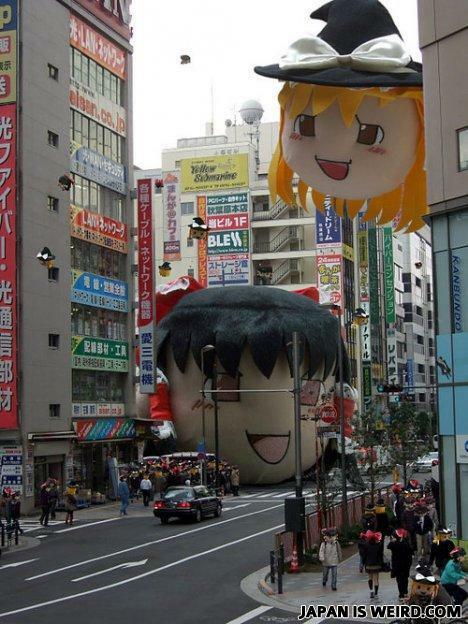 Notice how there are people in the crowd dressed as the giant heads, it's Touhou fest. Everyone seems to missing the fact that EVERYONE has one on their head! "why is nobody, NOBODY looking up?" Has this site taugh you nothing yet? He is a severe alcoholic and is slowly drowning himself in booze.